It started in Indy, at the Caribbean Cove Water Park hotel on the North West side. From there, it went to the Wyndham West, before finally settling in its home in Bloomington, where it has resided for what is now the fourth year. 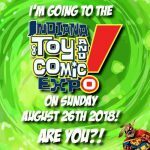 It’s the Indiana Toy and Comic Expo, and it’s happening this Sunday, the 26th! 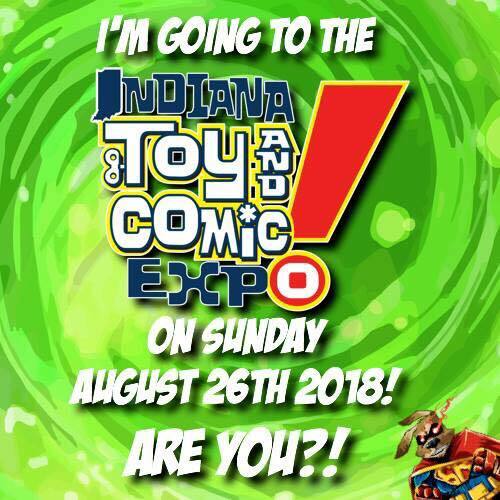 The Indiana Toy & Comic Expo (ITCE), running from 9:00 AM to 4:00 PM at the Monroe Convention Center, is exactly what is advertised in the name. It is a one day show, focusing on toys and comics, as well as local artists and creators. They don’t bring in guests for autographs, instead they focus on letting the draw be the dealers and creators in attendance, and it works beautifully for them. Plus, it enables them to keep the admission at a very reasonable $5, so you can put your money towards the dealers inside! Shows like this are a lot of fun. It’s smaller, so even though it’s open a shorter amount of the day, you can still see all the vendors, and take the time to dig through some long boxes, or totes full of action figure parts. You can take the time to find an area that’s NOT IN THE MIDDLE OF AN AISLE *ahem* and catch up with friends. You can sit and enjoy the costume contest, or even the custom action figure contest! You can spend time visiting the new Podcast Row, and talk to follks from The World’s Almost Finest Podcast, The NerdUp Podcast, The ITCE Podcast, the Five(ish) Fangirls Podcast, or the Indiana Geeking Podcast about their shows, and what they do. In addition to all that, this is on top of a charity auction, appearances by the Rebel Legion and 501st, and just enjoying a small, local show full of Geeks, Nerds, and people interested in many of the same things you are! I know, when I went last year, I was able to pick up an R5-D4 Pop figure, and Sexcastle from Kyle Starks. In other years, I’ve picked up action figures, toys for the Geekling, and got a really good deal on some Star Trek ship models. I can’t wait to see what I come across this year! How much is it? $5.00 at the door, with kids 12 and under free with a paid admission. Where can you find more information? Of course, you need to visit their webpage for all the details, but you can also follow them on Facebook, Twitter, and Instagram!